This dish will be a real treat on your festive table. 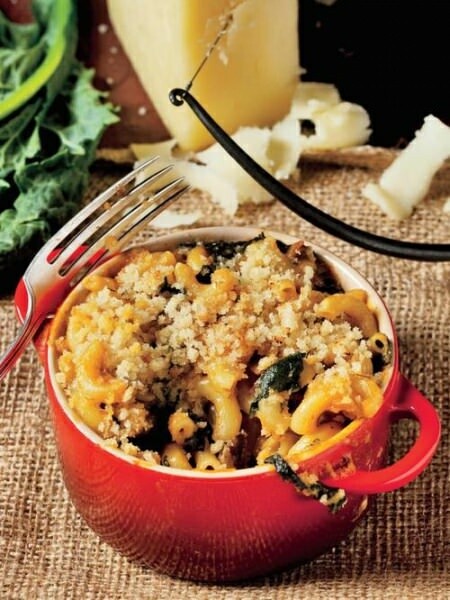 It has some appeal in it that`s why I advise you to try brussels sprouts, kale, and celery root gratin. A vegetarian dish with browned crust and fantastic flavor is both very delicious and healthy. Preheat the oven to 350 degrees and grease a 9-by-13 inch baking dish with butter. In a bowl combine butter, mustard, parsley, chives, breadcrumbs, pepper and ¼ teaspoon of salt, then toss to coat and put aside. Heat the cream and stock in a saucepan over a medium heat, add the celery root and let it simmer until it gets soft for about 8 minutes. While the celery is preparing, heat the olive oil in a pot, add the ham if you want. Cook it for 5 minutes over a medium heat until it gets golden brown. Then add the shallots, stir and cook for 3 minutes. Add the Brussels sprouts, salt, pepper and cook for 5 minutes until lightly grown. Add the kale and cook for 3 minutes, stir continuously until starts wilting. Then pour the apple vinegar and keep on the heat until absorbed, then remove. On the bottom of the dish place the celery root slices, then Brussels sprout mixture and pour it all with the liquid from the celery. Bake it for 20 minutes until the top brows. After that cover it with the breadcrumbs and keep baking for 15 minutes until it starts bubble around the edges. All these recipes must be tried. Isn`t your mouth watering when just think about them? Well, it will be very hard to choose only a few of them to make this season but we can leave the rest for the next year. What do you usually cook for Thanksgiving?